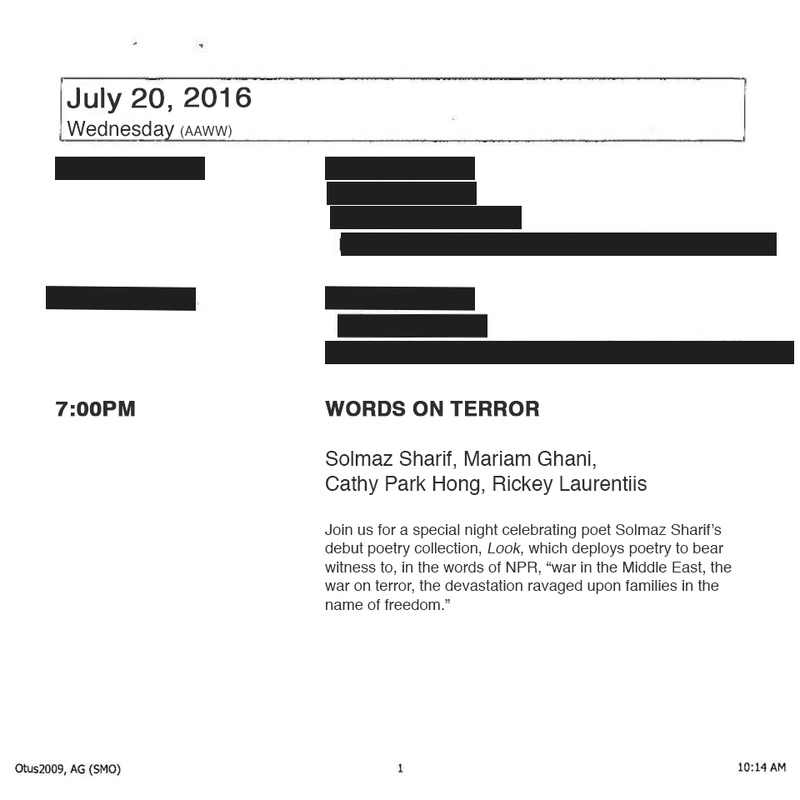 Join us for a special night celebrating poet Solmaz Sharif’s debut poetry collection, Look, which deploys poetry to bear witness to, in the words of NPR, “war in the Middle East, the war on terror, the devastation ravaged upon families in the name of freedom.” She’ll be joined by poets Cathy Park Hong and Rickey Laurentiis and artist Mariam Ghani, who will read their own work as well as Sharif’s. Solmaz Sharif’s new poetry collection Look (Graywolf Press 2016) appropriates language from the Department of Defense internal dictionary to create searing poems that critique the War on Terror. As Yusef Komunyakaa writes, “Solmaz Sharif’s Look confronts an empirical system of language and its effect on family and citizen, near and far-reaching, social and philosophical. By unearthing, decoding, and reconstructing half-hidden symbols of power built into nomenclature as well as everyday expression, the poet serves truth—sometimes delicately, other times brutally” The former managing director of the Asian American Writers’ Workshop, she is the recipient of a “Discovery”/Boston Review Poetry Prize, an NEA fellowship, a Stegner Fellowship, a Rona Jaffe Foundation Writer’s Award, and a Ruth Lilly Fellowship. She is currently a Jones Lecturer at Stanford University. Artist Mariam Ghani has collaborated with artist Chitra Ganesh since 2004 as Index of the Disappeared, an experimental archive of post-9/11 detentions, deportations, renditions and redactions. Her exhibitions and screenings include the Rotterdam, CPH:DOX and transmediale film festivals, the Sharjah and Liverpool Biennials, dOCUMENTA (13) in Kabul and Kassel, MoMA in New York, the National Gallery in DC, the St. Louis Art Museum, and the CCCB in Barcelona. Recently published by Creative Time Reports, Ibraaz, Triple Canopy, and the Manifesta Journal, she recently curated the international symposium ‘Radical Archives’, and has been awarded a number of fellowships including grants from Creative Capital, Art Matters, the Graham Foundation, CEC ArtsLink, NYSCA, the Mid-Atlantic Arts Foundation and the Experimental Television Center. Poet Cathy Park Hong--an early Van Lier fellowship recipient from AAWW--is the author of Engine Empire (W.W. Norton 2012), a poetic guide through the fictionalized boomtowns of the Californian old west, present-day industrialized China, and the digital future. Her other collections include Dance Dance Revolution (W.W. Norton 2007), chosen by Adrienne Rich for the Barnard Women Poets Prize, and Translating Mo'um (Hanging Loose Press 2002). 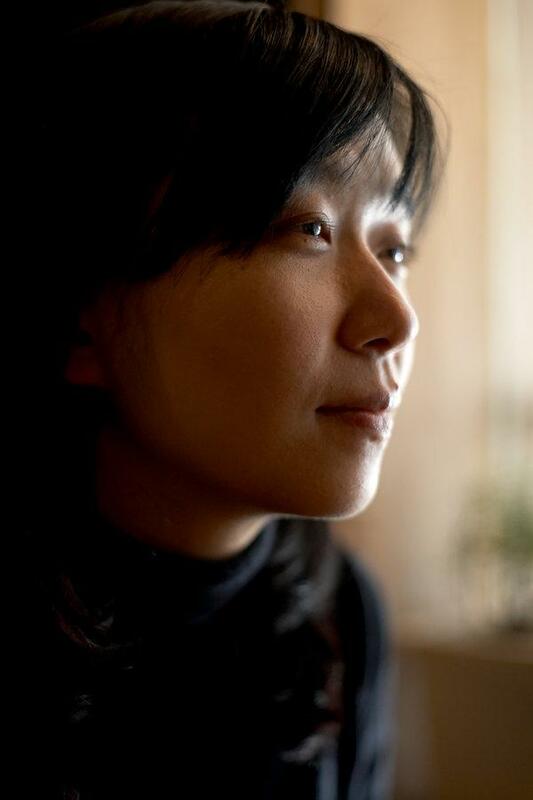 Hong is the recipient of a Guggenheim Fellowship, a National Endowment for the Arts Fellowship and the New York Foundation for the Arts Fellowship. She is the poetry editor of The New Republic and is an Associate Professor at Sarah Lawrence College. Rickey Laurentiis is the author of Boy with Thorn, selected by Terrance Hayes for the 2014 Cave Canem Poetry Prize (University of Pittsburgh Press, 2015) and named one of the top poetry book of the year by Buzzfeed, Poets & Writers magazine, LitHub, Split This Rock!, the Advocate, and the Poetry Foundation. Eileen Myles writes: “Rickey’s poem forces you through itself, all shuddering....The sound would be a series of squirms, the music of a very violent act. And this becomes beauty in Rickey’s hands.” He is an NEA and Ruth Lilly Fellow.